Plazy, an art critic, and del Moral, a photographer, have quite laterally done what the title of their book suggests, retracing the movements of the restless, often tormented Vincent van Gogh. The description of his travels and of his fretful though productive life is terse and vivid. The photographs, of some of the French landscapes still in existence that van Gogh saw and painted, of the remnants of the past still to be found in the towns in which he lived, and of the remaining houses in which he or family members lived, are generally of unusual interest. 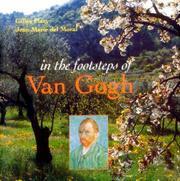 There are also apt juxtapositions of (often less-well-known) paintings by van Gogh with relevant photographs. Those who find van Gogh’s life and work particularly engrossing will find the book revealing and, given the tragedies surrounding the artist, rather moving.